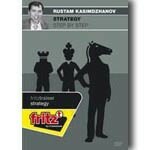 Making the right strategic decisions belongs to the most difficult tasks at the chessboard. But how can one enhance one's strategic understanding and methodical play? For the present video course Rustam has carefully selected games from his own practice which are dominated by positional and strategic considerations, clarifying in extensive annotations which thoughts the decisions of the grandmasters are based upon. He shows how the game plan is made already in the first moves of the opening and then - in the ideal case - purposefully continued step by step in the middlegame. At the end of this entertaining and practically relevant course, you will be familiar with many positional elements like, e.g., open lines, strong and weak squares, pawn chains, isolated pawns, space advantage, pawn majorities, hanging pawns etc., making you ready to use them for your own play. Video running time: 3:54 min.